Folkemødet’s 214 tents and 12 ‘event boats’ officially open for business today. Bornholm’s mayor, Winni Grosbøll, officially kicked off what Bertel Haarder, Folkemødet’s creator, envisioned as “the Roskilde Festival of politics”. This is the fifth year that Folkemødet has been held in Allinge on Bornholm, and although mayors and business people from other towns have suggested that the meeting could hit the road a bit to spread the wealth earned from the numbers that have swelled to well over 50,000 attendees, organisers, journalists and various types of security personnel, both the visitors who checked in early last evening and the locals in Allinge preparing for the onslaught seemed more than satisfied that the party is staying on the sunshine island. 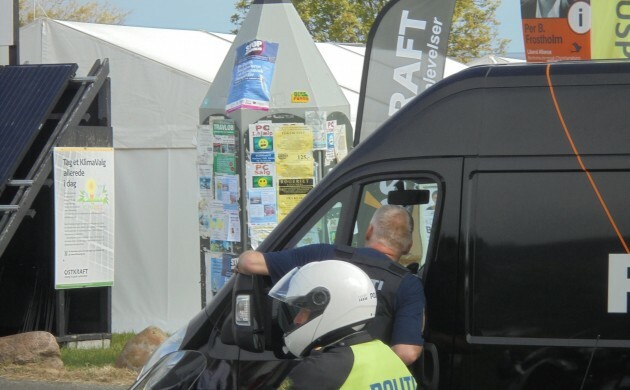 Scheduled appearances by anti-Islamist Geert Wilder – a subject of numerous death threats – and other ultra-nationalists have resulted in a much larger security and police presence than ever before. Estimates range as high as a ten-fold increase. “We are around and ready should there be any problems,” said one officer. No traffic is allowed along Folkemødet’s sprawling route, which stretches from Allinge Harbour north along the sea for a kilometre or so. Beer and other delivery vehicles are required to be in and out of the grounds before 8am. The uniformed officers in protective vests patrolling the concrete barriers that have been put in place give the route a feel similar to the frontage along a modern day embassy. Although organisers had promised faster and better internet coverage this year, journalists looking to file early-bird stories were stymied by a totally non-functioning system that showed full connectivity, but featured the endless spinning wheel of death when one attempted to log in. There is simply no way to cover the more than 2,000 events crammed into the next three days. The goal is to try to balance the political with the personal to get a taste of Folkemødet’s oddly compelling feel.